What are people really thinking when they meet you or come across you on social media? One important element that contributes to your home business success online is how people perceive you. This is a hot topic for me that I am extremely passionate about. After making mistakes with my online home business, I wanted to share some crucial lessons with you. Before I get into that, think about how others perceive you. Are you marketing yourself in such a way that is worth the attention of others? How about this: If you were not you, would you be attracted to you or your business or put off? Let’s look at this another way. With thousands of other distributors in your business selling the same exact products, why should someone buy from you? 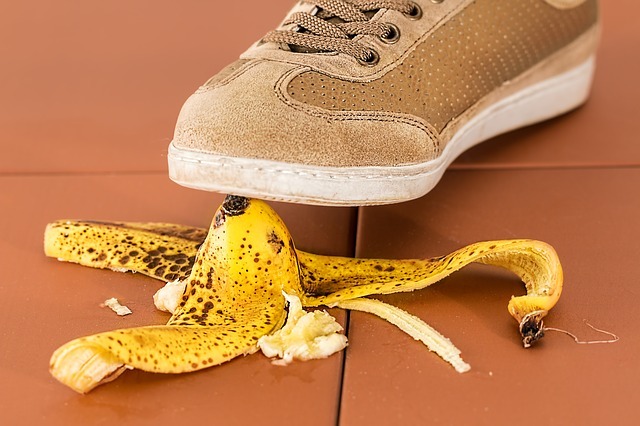 In this article I am sharing 3 critical mistakes that you should never make in your online home business and how to correct them. 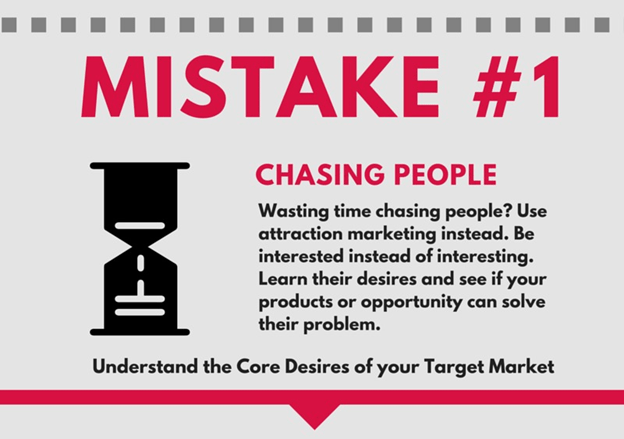 How much time do you spend chasing people down? Think about this: when you chase people who have no interest in your product or opportunity, it is time poorly spent and those people won’t have a good perception of you. Use Attraction Marketing Online: Become a problem solver and authority in your niche market. Create content that is value-based and provides great information to your audience. This will help you be the person that others seek out. As a problem solver, you can be the hunted instead of the hunter. Use F.O.R.M: Be interested in other people to start building those relationships. FORM stands for Family, Occupation, Recreation and Message. Ask questions in each of these 4 categories to learn more about a person, understand their needs and then share some key information that can benefit them. For example, if you met me, you would learn that I am very fit and at my perfect weight. You would definitely avoid sharing a weight loss product with me! But you would be surprised at how many people offer me these type of products simply because they didn’t take even a moment to get to know me. The home business world is full of marketers posting links to their products with no added value in the post content. Sharing links is a good thing when you provide useful content along with it. Why should someone click the link? What is compelling about the content that would drive someone to click? Provide information along with your link to help others be more engaged, especially if your content relates to their interest. Social media is important to earning you the reputation that you desire. Post meaningful content: If you share a link in social media, add some teaser text that will entice others to click the link. 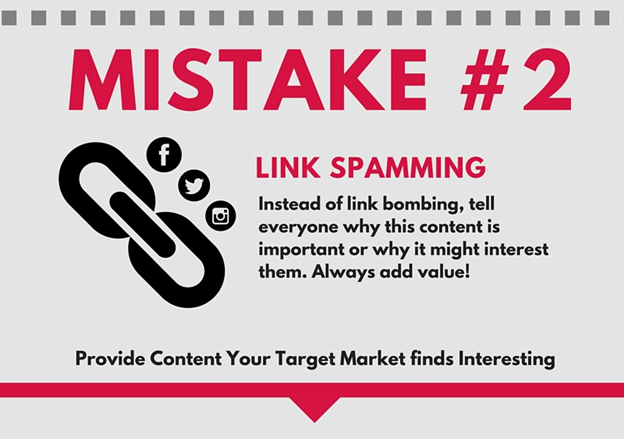 Make sure the link you post is helpful in some way to your target audience. Engage people: If people comment on your posts be sure to reply in a timely manner. This is how you can be a more reliable person. Comment on other people’s posts as well and join in the conversation. Be helpful and encouraging to others to be more positive and relatable to others. Promote other people: Do you have a customer or someone on your team who had a recent accomplishment? Shout them out in social media and give them the attention they deserve. Be consistent: Consistency is a key trait that can make or break how others see you. I have people who contact me about my network marketing business simply because my blog is updated on a regular basis, whereas other distributor blogs are a ghost town. How will you implement some of these tips in your social media networks? It’s true. I’m always surprised when home business owners go through all the work to get leads for their business but never pick up the phone! Whether you conduct your business online of offline, you need to have a follow up process that you use every time on a consistent basis. People need more than one touchpoint before they buy a product from you or sign up as a business partner. Following up helps you to educate your prospect as well as build a strong relationship. Have a well-thought out process at every stage: Each time you pick up the phone to have a conversation with a prospect, you should know where you want to lead them. What is your strategy if this is a first conversation? You want to find out more about the person and then lead them to some educational material to help them understand the business. Each subsequent call should further educate and answer questions. Follow up with those that say NO: What happens if a prospect says no? I always ask permission to contact them again in 3 months to see how they are doing. Most of the time, the person agrees. You never know, they may be ready in 3 or 6 months so keep them on your list and mark your calendar. Today I shared three crucial mistakes that can hurt your online business and some tips on how to fix that. Which of these resonated with you and why? What tips do you use in your home business to cultivate a positive brand? Share in the comments below. Which Glass Spray Bottles for DIY Products are the Best?